This month’s blog post continues our series of birthstones. We’re on part three and have gotten into our summer months! Let’s jump right in and discover the special stones that represent July, August and September. The name ruby comes from the Latin word rubeus meaning red. In ancient Sanskrit, ruby correlated to ratnaraj which means “king of precious stones.” Rubies have been treasured throughout history and are known as fiery gems. The only natural gemstone harder than a ruby, which measures at a 9 on the Mohs scale, is a diamond. Not only are rubies tough and durable for jewelry, but their strength and fluorescent red color makes them useful for watchmaking, lasers and medical instruments. Ruby is believed to bring success in wealth and love, promote courage, energy and awareness. Peridot is known for its insanely bright lime green glow and is associated with prosperity and good fortune. It is formed deep inside the earth’s mantle and brought to the surface with the help of volcanoes. Here in the islands, peridot symbolizes the tears of the Hawaiian fire goddess Pele. Peridot is said to possess healing properties that also protect against evil. Sardonyx — the gemstone which combines layers of sard and onyx — is known as the zebra-striped stone. In ancient times, sardonyx was known for its strength and protection and associated with happiness and courage. Spinel, the third and final gemstone of August, is most often mistaken for the sapphire or ruby. Spinel closely relates to both gemstones with it’s either vivid red color or cobalt blue hue. Spinel, unlike the ruby and sapphire however, holds a low Mohs rating. Spinel has been found in Cambodia, Sri Lanka, Thailand, Australia, Madagascar, Brazil, Nepal, Nigeria, Tanzania as well as the United States. When people think of sapphires they typically reference the rich blue stone that you see in movies. Though sapphires do come in an array of blue, they also come in a rainbow of hues and are classified as “fancies.” The name sapphire comes from the Greek word sappheiros meaning “blue stone”. These dreamy stones are found in India, Thailand, Vietnam, Sri Lanka, Brazil, Africa, North America, Australia and Myanmar. Sapphires represent loyalty, sincerity and integrity. They are known to help focus the mind, while assisting in channeling higher powers. That completes part three of our gemstone series. Join us next month as we wrap it up with months October, November and December and their accompany stones. 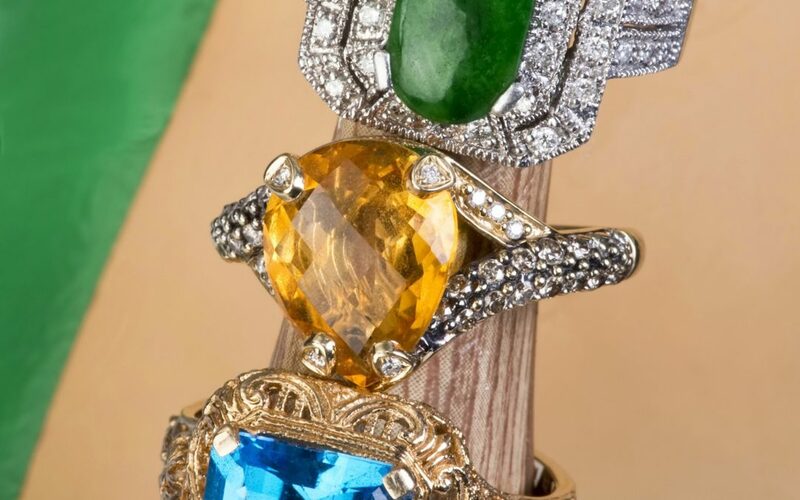 Gemstones are always a fun subject and we love getting to know the history behind the stones that help to make our jewelry one of a kind. How are you enjoying our series? Let us know in the comments below. While you’re at it, take some time to explore our site. Our inventory is overflowing with gorgeous pieces and our professionals are ready to help make all of your jewelry dreams come true. What’s the Hype on the Halo Ring?